Ruchi Soya Industries Limited, India’s leading Agri-FMCG company with a turnover of over Rs. 27, 000 crores has announced the launch of Mahakosh Hunky Chunky Soya Chunks in Madhya Pradesh & Chhattisgarh. The product has been introduced in the 2 states following a successful pilot in select Northern and Eastern markets. Mahakosh Hunky Chunky has been launched as a hygienic, cost effective, protein rich vegetarian meal option for consumers. 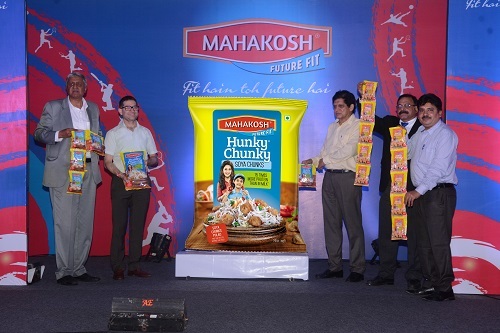 With the launch of Mahakosh Hunky Chunky, the company has extended its highly popular Mahakosh range from Oils into the Soya Chunks segment. The brand ambassador for Mahakosh is renowned Indian actress - Madhuri Dixit Nene. The Mahakosh brand is positioned on the health platform with its unique brand proposition of ‘Fit hain toh Future hai’. Mahakosh Hunky Chunky Soya Chunks contains 52% protein by weight. The core proposition of Mahakosh Hunky Chunky Soya Chunks is that it contains 15 times more protein than cow’s milk which makes it extremely important to include it for the growing nutrition needs of the children. “As protein deficiency is core problem affecting a majority of Indians; Mahakosh Hunky Chunky has been launched to provide a hygienic, cost effective, protein rich vegetarian meal option to consumers,” said Mr. Dinesh Shahra – Founder & Managing Director, Ruchi Soya Industries Limited. “Brand Mahakosh stands for natural goodness and health and this philosophy have been extended to Mahakosh Hunky Chunky as well,” Mr. Shahra added. A recent study by Indian Market Research Bureau (IMRB) reveals that ‘80% Indian diets are protein deficient’. The IMRB study further states that as many as 91% vegetarians and 85% non-vegetarians are protein-deficient in our country. “Mahakosh is one of India’s leading edible oil brands with annualized sales of over Rs. 2,000 crore. We are poised to take this brand to even greater heights by extending it into soya chunks category. With our core proposition of containing 15 times more protein than cow’s milk; Mahakosh Hunky Chunky will target consumers in the mass segment,” said Mr. Alok Mahajan – Head of Marketing, Ruchi Soya. “We plan to capture 5% share in the initial months and around 10% share of the Soya Chunks segment in our key markets over the long term,” Mr. Mahajan added. The key markets of the brand are West Bengal, Madhya Pradesh, Rajasthan, Uttar Pradesh, Delhi, Bihar and the North Eastern states. Mahakosh Soya Chunks provides a solution to the mothers to increase protein in their children’s diet and help in their overall growth. The brand proposition of Mahakosh “Fit hain to Future Hai” is also evident in the new Soya Chunks TVC. Mahakosh Hunky Chunky would be available in chunks & granules and will be economically priced. Mahakosh Hunky Chunky Soya Chunks will be available in 60 gms for Rs.10, 90 gms for Rs.15, 200 gms for Rs.35 and 1kg for Rs.100 and Soya Granules will be available in 90 gms for Rs.15 and 1 Kg for Rs.100. Ruchi Soya is India’s leading Agri FMCG and the country’s number one cooking oil and soy foods company. Its popular brands include Nutrela, Mahakosh, Sunrich, Ruchi Star and Ruchi Gold. An Integrated player from farm to fork; Ruchi Soya has secured access to oil palm plantations in India and other key regions of the world. Ruchi Soya is also the highest exporter of soya meal, lecithin and other food ingredients from India. Ruchi Soya is committed to renewable energy and exploring suitable opportunities in the sector.